Once considered more precious than gold, cinnamon still one of the most popular spices in the world, touting both great culinary value and healing benefits. Long appreciated as a staple spice in culinary traditions across the globe, it now seems almost impossible that cinnamon was once a rare, even holy commodity. Such, however, was the early reality of this sweet yet heated seasoning, revered ancient times as it is today not only for its unique taste but also for its nutritional and medicinal value. The exact location of the cinnamon bark tree's first habitat is still subject to debate, but it is widely accepted as a native of the tropical regions of Southeast Asia, with the longest documentation in Sri Lanka and certain parts of India. Enhancing digestive function. Foods with cinnamon are often eaten as a dessert or after a meal in order to aid with digestion, as well as eliminate harmful bacterial growth in the digestive tract. Lowering blood sugar levels. Research shows that cinnamon may help lower blood sugar levels, which could benefit people with diabetes, although the studies are not conclusive. Lowering nasal inflammation. Cinnamon's strong, sharp scent may help clear the sinuses. Preventing mosquito-borne disease. Research shows that compounds in cinnamon oil may help protect the skin against mosquito bites. Treating neurological disorders. Research shows that cinnamon can help fight against neurological disorders, such as Parkinson's and Alzheimer's diseases. Cinnamon has also been traditionally used as tooth powder for relieving toothaches, oral microbiota, and bad breath, as well as for treating bacterial infections. The main active ingredients found in its essential oil are cinnamaldehyde and eugenol, as well as significant amounts of safrol and linalool. Cinnamon's antibacterial and antimicrobial effects can be attributed to its presence of cinnamaldehyde compounds, which are primarily responsible for killing harmful bacteria and fungi that enter the body. Additionally, cinnamon owes its hypoglycemic properties to its presence of hydroxychalcone, which stimulates glucose oxidation, breaking it down in the body. In turn, it has numerous anti-inflammatory properties, which can be attributed to several different flavonoid compounds such as gossypin, gnaphalin, hesperidin, hibifolin, hypolaetin, oroxindin, and quercetin. Furthermore, used in the digestive processes, the nitric oxide produced by cinnamon not only stimulates blood circulation, but also possess antibacterial and anti-inflammatory properties. Cinnamon may help prevent the onset Alzheimer's disease by reducing the formation of toxic β-amyloid polypeptide. Digestive properties are also present in apple and papaya , whereas graviola and rhubarb are great to keep in check blood sugar levels. Cinnamon is likely safe for most people when taken by mouth in controlled dosages. With overconsumption, cinnamon can cause irritation on the mouth and lips. It can also irritate sores that are already present, such as canker sores or cold sores. When applied topically, cinnamon can cause skin irritation and redness. Because cinnamon contains small amount of coumarin, which can cause liver damage, it is not recommended for anyone to consume too much cinnamon in concentrated doses. Due to its anti-coagulant properties, those who will be undergoing surgery should limit their consumption of cinnamon. 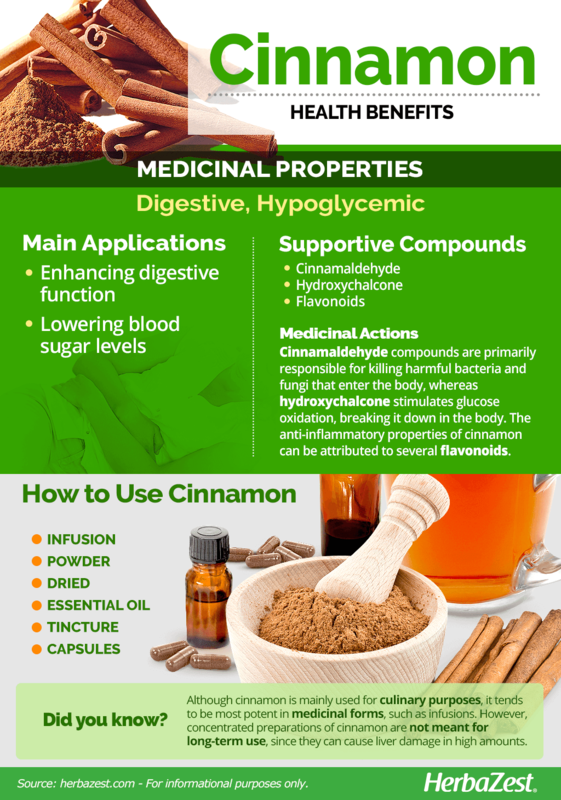 While cinnamon is typically good for diabetic patients, those who have low blood sugar levels should not consume cinnamon in medicinal amounts, due to its hypoglycemic components. Women who are pregnant or breastfeeding should also limit their consumption of cinnamon because large doses of coumarin can induce miscarriage. As one of the most popular spices in the world, cinnamon is mainly used for culinary purposes. However, it tends to be most potent in its medicinal forms of consumption, such as infusions. It is worth noting, however, that some medicinal forms are considered too heavily concentrated to be beneficial for long term use, due to its presence of coumarin. Dried. Cinnamon sticks have digestive and hypoglycemic effects when infused or added to culinary preparations. Powder. Added to salads, smoothies, and cereal, ground cinnamon help lower blood sugar and treat infections. Infusion. 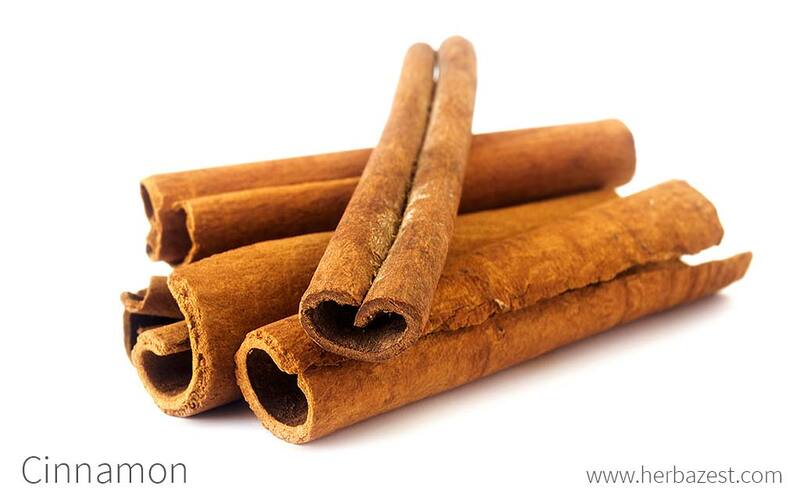 When brewed into a warm infusion, cinnamon can lower blood sugar levels thanks to its hypoglycemic properties. Drinking cinnamon tea or inhaling cinnamon steam can also help relieve sinus pain. Cinnamon's essential oil consumption should be carefully monitored, due to the presence of coumarin, which can be toxic in large amounts. Essential oil. This concentrated form of cinnamon is beneficial for enhancing digestive function because of its antibacterial and antioxidant properties. Tinctures. Cinnamon tincture is an alcohol-based preparation that can be useful for lowering sinus inflammation, as well as for helping digestion and lowering blood sugar. Capsules. This supplemental form can aid digestion and lower blood sugar; however, it contains a high coumarin content and its consumption must be closely monitored in order to prevent toxicity. Dried cinnamon, in both stick and powdered form, are so popular on a worldwide level that they are easily found year-round in grocery stores, supermarkets, and health food stores alike. Many ethnic markets also carry the spice and several different varieties of it, though full-sized trees are restricted to tropical regions of the world and are not generally available as ornamental plants. Though less than common that other herbal supplements, cinnamon capsules and extracts are available to harness the spice's raw nutrients without its scent or flavor. These can be found in limited supply in specialized health food stores and wholesale retailers, though online outlets offer the widest variety of brands, price points, and concentrations of the active ingredient. FULL-SIZED TREES ARE RESTRICTED TO TROPICAL REGIONS OF THE WORLD AND ARE NOT GENERALLY AVAILABLE AS ORNAMENTAL PLANTS. Unlike some other evergreen trees, the cinnamon bark tree is not tolerant of temperate environments and prefers the hot, humid, tropical climates of its native growing regions. Despite its sensitivity to cold weather, it is relatively easy to grow. Cinnamon trees should grow in full to partial sunlight. Cinnamon prefers a well-drained, slightly dry, and sandy soil. Cinnamon can be propagated by cuttings. But the easier and more common method is propagation by seeds. Although cinnamon can tolerate occasional frost, it will not survive temperatures below 29° F (-1° C). As a tropical crop, cinnamon requires regular watering; however, care should be taken not to over-water the plant in order to prevent root rot. More detailed information about growing cinnamon can be found in the herb garden section. Cinnamon is a medium-sized evergreen that grows an average of 33 - 49 feet (10 - 15 m) tall. It is easily distinguished for the strong, pleasant aroma of its bark. The leaves of the tree are thick and lanceolate in shape, growing on smooth gray branches. Cinnamon trees produce small yellow or green flowers on panicles and a berry fruit, but the smooth, pliable bark is what is harvested as seasoning and considered most important. The cinnamon bark tree is a member of the Lauraceae, or laurel family, sharing characteristics with approximately 3,000 species of flowering plants, including avocado (Persea americana) and bay laurel (Laurus nobilis). Although Cinnamomum cassia is the most popular marketed cinnamon, the true cinnamon spice is obtained from Cinnamomum verum. However, about 350 related species, indigenous to the Asia-Pacific Region and tropical America, with approximately 50 tropical and subtropical trees and shrubs, are cultivated for their economic value. Cinnamon quills are harvested fall under four different categories, based on their thickness, which includes Alba, Continental, Mexican, and Hamburg. Alba cinnamon is the thinnest, averaging 0.24 inches (6 mm) in diameter; it is followed by Continental, the most common, and next comes Mexican. The thickest, at 1.3 inches (32 mm) across, is Hamburg cinnamon. One of the oldest known spices, cinnamon is one of the few herbs to be mentioned in the Bible. It was also used in ancient Egypt as an embalming agent for mummification. Cinnamon was so highly treasured, it was considered more valuable than gold. Cinnamon quickly became one of the most important ingredients in Ayurvedic medicine, and was first exported to eastern Africa and brought north to Egypt and the Arabian Peninsula as early as 2000 BCE. After its use as an incense scent became established, it arrived to Greek and Roman civilizations via Alexandria, and it was infused with a stronger religious and ritual value and a higher market price as a spice. Throughout the Middle Ages, it was one of the most valuable commodities on the Silk Road and widely coveted by the richest tables across Western Europe. Once colonization gathered steam in the 17th and 18th centuries, it was finally possible for worldwide consumption to become regular. Though once an expensive luxury - according to the Roman historian Pliny, a pound once cost 300 denarii, the equivalent of ten months' wages - cinnamon is now a worldwide industry that makes finding the spice a relatively easy endeavor. Indonesia is the current leader in its yearly production, having generated 92,900 tons in 2011, representing 46% of the world's supply. China, Vietnam, and Sri Lanka also benefit economically from its sale. For preserving food. Traditionally, cinnamon was also used as a fish and meat preservative because of its antimicrobial properties. For repelling mosquitoes. Cinnamon has a history of use as a natural insect repellent, and oil from the leaves of the tree have proven particularly effective in killing mosquito larvae. For its scent. It essential oil gives off an aroma that many find pleasing, and thus fragrance-based industries such as perfumery and candle-making have also employed it in this way. Likewise, its pleasant taste and smell is also a common mask for the fouler scents of other medicinal remedies.